The purpose of this website, sponsored by the leading arbitration law firm Aceris Law, is to provide free access to useful arbitration information and international arbitration resources in order to make information about the leading form of international dispute resolution more readily available to businesses, lawyers, in-house counsel, government officials, students and academics alike. 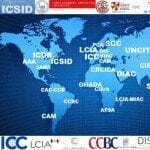 A variety of free arbitration resources are provided, including the only arbitration cost calculators to automatically estimate the full cost of resolving ICC, LCIA, ICSID, ICDR, HKIAC and SIAC arbitrations, an arbitration search engine that instantly searches all leading publicly-available arbitration legal resources for documents or information, an online library of leading books on arbitration, a database of arbitration-related legal materials from the public domain, tools to find international arbitrators, tips on drafting arbitration clauses, model Requests for Arbitration and model Answers to Requests for Arbitration, a collection of obscure domestic arbitration laws and a variety of other arbitration resources. Links to the website’s main resources, which are updated regularly, are found below. You may also use the website’s search form to search for arbitration information in a dozen languages. International arbitration is the leading form of international dispute resolution between businesses of different nationalities, as well as between foreign investors and States. It is a consensual, neutral, binding, private and enforceable means of international dispute resolution, which is typically faster and less expensive than domestic court proceedings. It is sometimes called a hybrid form of international dispute resolution, since it blends elements of civil law and common law procedure, while allowing parties an opportunity to design the procedural rules under which their dispute will be resolved. Companies frequently include international arbitration agreements in their commercial contracts with businesses located in other States, so that if a dispute arises they are obligated to arbitrate before neutral arbitrators rather than to pursue litigation before a foreign court. A relatively recent phenomenon, investor-State arbitration concerns arbitration proceedings by foreign investors against States on the basis of bilateral or multilateral investment treaties, or domestic laws providing consent to arbitration. Thanks to the Convention on the Recognition and Enforcement of Foreign Arbitral Awards of 1958, the awards of international arbitrators can be readily enforced in over three-quarters of the countries of the world, providing one of key advantages of arbitration as compared to domestic litigation to resolve international disputes.